If you’ve always been intrigued by the culture and practice of Voodoo now is your opportunity to get an insight it by learning from the master himself, the Witch Doctor, with big wins for every doll that you stick pins in! With an African tribal setting, the Voodoo Vibes slot machine is played across 5 reels with 25 paylines that can be altered to your preference and sees you surround a camp fire outside a thatched grass hut with skulls and bones hanging over the door with tiki torches positioned so that you don’t stick the pins into yourself. It’s not for the faint-hearted though as dramatic and rather spooky sounds can be heard all night, but it includes several bonus features with the Witch Doctor lining up a range of Voodoo dolls for you to stick silver pins in for cash prizes, plus you could enjoy 10 free spins and Scatter pays of up to 100x your stake – all of which make it worth withstanding the dark and spooky surroundings! 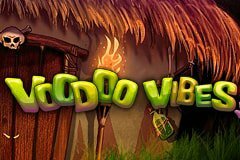 Hearing an evil laugh ring out playing the Voodoo Vibes slot machine means only one thing – the Witch Doctor has greeted you with his presence on the reels. He may appear sinister with a skull face design, playing card top hat and a skull on the end of a stick over his shoulder but he is certainly worth bearing as he is the Wild symbol with the ability to substitute for all but the Scatter and Bonus symbols, plus he is the most valuable on the reels with five of him on a payline resulting in a jackpot prize of 7,500 coins. Scatter symbols are represented by a slithering green snake who is ready to sink his teeth into something while the Bonus symbol is a Voodoo doll but there is plenty more to see related to the culture and practice of Voodoo. There is a white skull with a candle on top which burns away to give you light as you stick pins in the doll, a Voodoo Priestess who hands you all of the pins that you need, a chicken scarpering in fear that you’ll grab it, a potion bottle with a skull pendant around it which is half filled, plus four different filigree styled icons which have the lowest values and are a pleasant change from playing cards. You’ll get earn an opportunity to be a Witch Doctor once you land the Voodoo doll three or more times on an active payline as you trigger an instant win bonus game which is rather spooky yet highly rewarding. Once the bonus game has been triggered you’ll see a range of Voodoo dolls on screen with you being armed with a large pin. Yep, you guessed it, you simply have to click on the Voodoo doll of your choice that you would like to stick the pin in before it bursts open and a cash amount is displayed on screen, with this continuing and the values being accumulated until you stick the pin in the one without a cash value which sees the feature end. That’s not all though as these slimy snakes are on your side and want to help you clean up therefore all winning combinations on the reels are subject to a 3x multiplier bonus and it’s also possible to re-trigger additional free spins when three or more snakes come into sight again. Don’t worry, there is no need to be spooked as Net Entertainment have designed the Voodoo Vibes slot machine in a cartoonish style which is a lot of fun as compared to the Taboo Spell slot machine from Microgaming which is a lot darker and more sinister.